Monhegan Island, 10 miles offshore from midcoast Maine, is a picturesque summer haven for artists and vacationers. By the time the island was visited by Samuel de Champlain, Capt. John Smith, Bartholomew Gosnold, and other explorers in the 1600s, it had already been an outpost for many European fishermen. Some believe the Vikings visited the area around 1,000 A.D. and left carvings on the rocks of nearby Manana Island. Others believe the strange engravings were made much earlier. The first permanent European settlement was established in 1619. Before that, Monhegan Island was long used by local Indians who gave it its name, which means "island of the sea." The island's history was turbulent for several centuries. In the late 1400s, Gaspar Cortereal of Spain landed at Monhegan and took 57 Indians to sell as slaves, but his ship was apparently wrecked on the return voyage. During King Philip's War in 1676, settlers took refuge on the island and were eventually relocated to other locations along the coast. In 1689, Baron Castine captured the English settlement for the French. 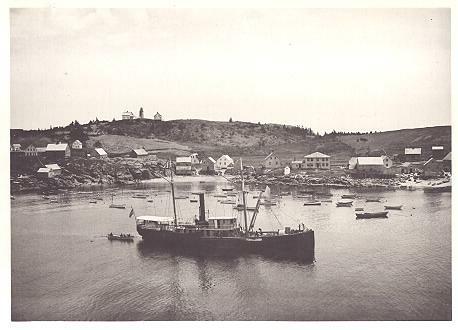 For many voyagers coming across the Atlantic, Monhegan was the first sight of land. By the early 1800s, trade in the area was increasing. In 1822, Congress and President James Monroe authorized the building of a lighthouse on one of Monhegan's highest points for $3,000. The light went into operation two years later. The first lighthouse was a 30-foot conical stone tower. Thomas B. Seavey, the first keeper, remained at Monhegan for 10 years. After much damage from storms, the lighthouse was rebuilt in 1850. The 48-foot granite tower built that year still stands. It is very similar to the lighthouse on Whitehead Island, built at about the same time. A new two-story keeper's house was built in 1874. In 1856, the original 10 lamps and reflectors were replaced by a powerful second-order Fresnel lens. With its light 178 feet above the sea, Monhegan Island Light is the second-highest light in Maine (after Seguin Island). In 1855, a fog bell station was established at Manana Island, just west of Monhegan. The 2,500-pound bell was replaced by a Daboll trumpet in 1870. This signal still wasn't loud enough, so a steam whistle was installed two years later. Finally, in 1877, a powerful first-class Daboll trumpet was installed at Manana Island. Charlie Dyer, seen here with his wife, Nettie, was keeper at Monhegan 1924-36. Courtesy of the Monhegan Museum. For a time, the keeper at Monhegan could push a button that would sound a gong in the bedroom of the fog signal keeper at Manana, who would jump out of bed to start the fog signal. The extant fog signal building and brick engine house on Manana Island were built in 1889. In 1861, Keeper Joseph F. Humphrey left to fight in the Civil War, along with his two sons. His wife, Betsy Morrow Humphrey, was left with her other eight children to tend the light. Joseph Humphrey died in 1861 and Betsy became the official keeper. In 1864, she received word that her 17-year-old son Albert was killed in the war. Her other son, Edward, returned home disabled. Betsy Morrow Humphrey remained keeper at Monhegan until 1880. Way off there to the north spread out the woods and forests of Maine, miles and miles each way, as far as the eye could penetrate; and out there to the west , the south, the east, stretched that limitless blue expanse, heaving, rolling, sparkling, dotted with its flaky signs of enterprise and commerce, which dipped and bowed to the heaving sea, some close, some far away, others showing a dim outline on the distant streak which limits the boundary of our vision. Dan Stevens, whose original name was Mathew Murphy, was keeper from 1902 until his death in 1919. He had enlisted in the U.S. Navy when underage, and he was discovered and discharged. He reenlisted after changing his name to Daniel Stevens. We are satisfied here because it's a good place. Why shouldn't we be satisfied? This is one of the loveliest spots on the great round earth. What do we want better than this? And it's all ours! We can look at it all when we want to, and breathe this good air, and be free and well and happy as anybody can be in this world. The Globe article described Stevens, who was originally from Boston: All visitors to Monhegan know of Dan Stevens, the lightkeeper... He is the most conspicuous resident, and to see him is to remember him. Born in Boston... and graduated from the school of hard knocks, a fisherman, sailor and navy man in turn . . .
Stevens had been a master of a sloop-of-war, and while in Europe he met his wife-to-be. Keeper Stevens and his wife lived at the Manana Island fog signal station for 12 years (1890-1902), then moved to Monhegan with their two sons and a daughter. They kept livestock, including a horse, on Monhegan. A cable providing phone service was extended to Monhegan Island in 1919 to make it easier for the keepers on Monhegan and Manana island to communicate with the mainland. The Coast Guard laid a new cable in the 1950s. An 1857 keeper's house was torn down in 1922. The station remained staffed by civilian keepers until 1956, when the Coast Guard took over. Beginning when the light was automated in 1959, the Coast Guard keepers at the Manana Island Fog Signal Station were given the additional duty of keeping an eye on the light at Monhegan. During a 1981 snowstorm, two Coast Guardsmen were crossing the harbor when their boat capsized. They were rescued by the island's harbormaster and a selectman. In 1962, the lighthouse grounds and buildings, except the lighthouse itself, were sold to the Monhegan Associates. A museum was opened in 1968 in the 1874 keeper's house, focusing on the island's rich history and wildlife. Left: Seen here in June 2007, Ernie DeRaps was the first Coast Guard officer in charge at Monhegan Light Station. The Monhegan Museum is open daily through most of the summer. An 1855 fog bell used at Manana Island is on exhibit outside the museum. The bell was the subject of Jamie Wyeth's well-known painting, "Bronze Age." In 1985 the property, except for the lighthouse, was transferred to the Monhegan Historical and Cultural Museum Association. Under the Maine Lights Program, the lighthouse became the property of the association in 1998. The association has reconstructed the 1857 assistant keeper's house to serve as a museum for their art collection. It is the first time a keeper's house has been reconstructed in Maine. Monhegan has a long tradition as an inspiration to artists; the distinguished list includes Edward Hopper, Rockwell Kent, George Bellows and Jamie Wyeth. The association has also had the covered walkway to the tower reconstructed in recent years. In 2006, the Monhegan Museum was awarded a grant from Heritage Preservation for an assessment of the buildings. Problems found in the lighthouse tower included deteriorating pointing in the exterior granite, leaking and rusting in the lantern, derioration of iron surfaces, peeling lead paint on the interior brick walls and iron stairs, and more. In 2009, the J. B. Leslie Company was contracted to carry out the restoration of the tower. At this writing in late September 2009, most of the work has been completed. The light was converted to solar power in 1995 and is still an active aid to navigation. Monhegan Island can be reached by ferry from Port Clyde, New Harbor, and Boothbay Harbor. Reaching the lighthouse requires a moderate uphill walk. Keepers: Thomas B. Seavey (1824-1834); George B. Wormell (1834-1841); Samuel Albee (1841-1845); Francis Pierce (1845-1849); John Hatch (1849); James Wallace II (1849-1853); Thomas Orne (1853-1857); Francis A. Handley (1857-1861); Joseph P. Humphrey (1861-1862); Betsy Morrow Humphrey (1862-1880); Sidney G. Studley (1880-1883); William Stanley (1883-1902); Daniel Stevens (1902-1919); Herbert Robinson (1919-1922); Maurice M. Weaver (1922-1924); Norman Oliver (1924); Charles Dyer (1924-1936); William H. Woodward (1936-1937); Vinal Foss (1937-1945); John Faulkingham (1945-1951); William Bardwell (1951-1952); Paul Baptiste (1952-1954); Henley Day (1954-1956); Ernest DeRaps (1956-1957); Dewey Blount, Jr. (1957-1960).